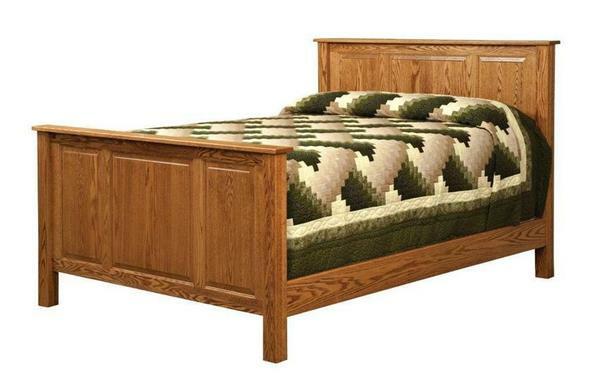 Handcrafted from beautiful, solid hardwood, our Amish Raised Panel Bed makes the perfect centerpiece for any bedroom. Available in your choice of eleven different hardwoods and many finishing options, you're sure to find the perfect bed to match seamlessly into any decor! Add the optional two drawer footboard, for an excellent way to easily add more storage space to your room. * Every piece in our Ida Bedroom Collection is handcrafted to ensure an heirloom quality piece that can be handed down for generations! Call one of our Amish Furniture Specialists today with any questions or to start your order by phone. Toll-Free (866) 272-6773. King: 81 1/2" x 88 1/2"
Queen: 65 1/2" x 88 1/2"
Full: 59 1/2" x 84 1/2"